November 25, 2018, Cairo – The American University in Cairo (AUC) held a memorial service to honor the life and legacy of Professor Emeritus Galal Amin. Family, friends, faculty and students of the late professor gathered the University to share stories about his life and accomplishments, and to share some words about his impact on their lives. 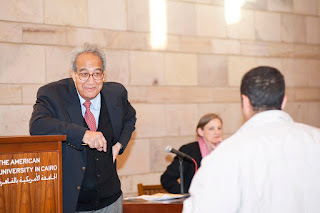 Besides teaching in AUC’s Department of Economics for 44 years, Amin was also an award-winning economist, prominent writer and commentator, and AUC Press author. However, to those who got the opportunity to meet him, he was more than just a distinguished academic and encyclopedic thinker. He was a mentor, an advocate for Egypt and, most importantly, an inspiration. “He could make even perennially dry subjects like microeconomics exciting,” laughed Mona Said ’89, ’91, associate professor and chair of AUC’s Department of Economics. As dedicated as he was to AUC, Said believes that Amin embodied the vision of AUC’s Department of Economics –– to be a hub of inspirational teaching and creative research with regional expertise and global impact. “Given who he was and what he meant to all of us, we could have simply stated that our vision was carried on by the legacy of Galal Amin,” shared Said. “He gave sufficient weight to qualitative areas, including the impact of economics on ordinary people, the impact of economics on quality of life and the impact of economics on communities at large,” said Walid Abdelnasser, director of the Regional Bureau for Arab countries, World Intellectual Property Organization, describing how Amin stood out within his field. At times heartwarming, at times heartbreaking, the memorial service was a testament to how Amin was an inspiration to his students, friends and Egypt at large. “Some people count themselves lucky or honored to have been in one of his classes or to have been one of his colleagues. How honored am I to have had him by my side for half a century?” said Danya Amin tearfully. Amin received an LLB from the Faculty of Law, Cairo University in 1955, and an MSc and PhD from the London School of Economics in 1961 and 1964, respectively. Prior to joining AUC in 1979, he was a visiting professor of economics at Ain Shams University and the University of California, Los Angeles, and was economic adviser to the Kuwait Fund for Economic Development. Amin was awarded the Sultan Qaboos Awards for Culture, Arts and Literature in 2017, the State Appreciation Award in Social Sciences in 2013 and the Sultan Bin Al Owais Cultural Foundation Award in recognition of his contributions to economics, politics, community and culture in 2010. He was also the recipient of the Award for Economics from the Kuwait Foundation for the Advancement of Science; the Order of Merit for the Sciences and Arts from the President of Egypt; and the Egyptian State Prize for Economics.